Republic Act 9344 or the Juvenile Justice Welfare Act (JJWA), promulgated in 2006, is a significant legal safeguard for the dignity of the Filipino child. With this law, youth offenders–most of whom are from disadvantaged socioeconomic sectors–will not be submitted to the dehumanizing conditions in correctional institutions. JJWA likewise provides measures and initiatives to ensure that children in conflict with the law will be rehabilitated, and eventually be reintegrated to the society as contributing members. This 17th Congress, the protection for the Filipino child provided by JJWA, is in peril. There have been several attempts to revert the minimum age of criminal responsibility to nine. In fact, six bills supportive of this measure have been filed in the House of Representatives. The bills have already been heard by the sub-committee on Correctional Reforms and are expected to pass soon, with an overwhelming likelihood of getting the same result in its mother committee, the Committee on Justice. 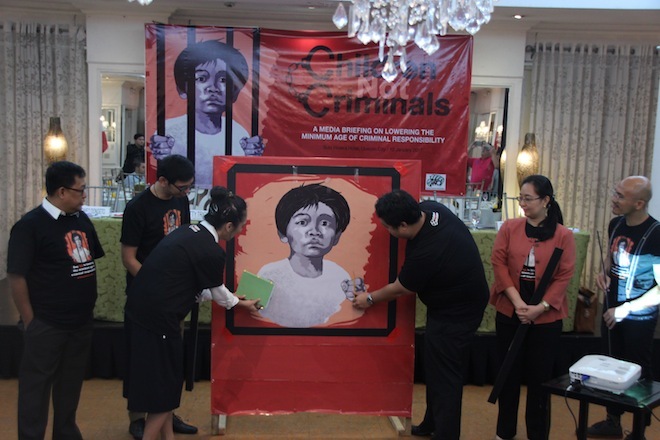 The Child Rights Network (CRN) opposes moves to lower the minimum age of criminal responsibility (LMACR). CRN as a consortium of child rights advocates, is united in conviction that LMACR is detrimental to the best interests of children in conflict with the law (CICL) and would impede their rights to survival and development. Studies have shown that criminalizing children leads to recidivism. Detention and/or incarceration of children have also been linked to adverse effects on a child’s mental, physical and emotional development, as they are likely to be subjected to discrimination and abuse while detained. Furthermore, jailing children deny them of opportunities for advancement through education, and future employment. The proposals to lower the minimum age of criminal responsibility also ignore scientific evidence that a child’s brain is structurally and functionally immature, which influences their decision-making and increases their tendency to engage in risky behaviors during adolescence. Duty bearers are enjoined to remain committed to making the current system work, as there are sufficient measures to hold children accountable for their offenses, while respecting their developmental capacities. There is strong evidence that these measures are effective in restoring and reintegrating children to the community, as documented by child rights advocates. Focus should be on replicating these positive results to make the law succeed for all children, not amending the said law, and in the process, compromising the welfare of CICL. The speed at which bills for the lowering of MACR progress shows that this measure is supported by House leadership. There is an urgent need for consolidation of support and intensified actions to prevent the bills from further prospering in the legislative mill and retain the minimum age of criminal responsibility at 15. A jail is no place for a child. We should not allow retrogressive bills such as this to reverse the advances in child protection in the Philippines and put children to jail. Instead, we should support efforts to strengthen and enhance the implementation of Juvenile Justice and Welfare Act.